How do I transfer my domain registration to DreamHost? If you have a domain registered at another provider, but would like to manage it through your DreamHost account, you can transfer this domain registration to DreamHost. This makes it easy to manage all aspects of your domain from a single location. You can also transfer a domain registration from another DreamHost account to your own if you are taking over domain ownership from another person. This page describes the process of transferring your domain registration to DreamHost. If you already have an active account and you want to transfer your registration, please review the steps below. DreamHost only allows certain supported TLDs to be transferred in. The following TLDs are not supported for incoming transfers at DreamHost: .AM, .AT, .BZ, .FM, .JP, and .WS. For more information, visit DreamHost's TLD webpage for a current list of domain extensions with pricing. 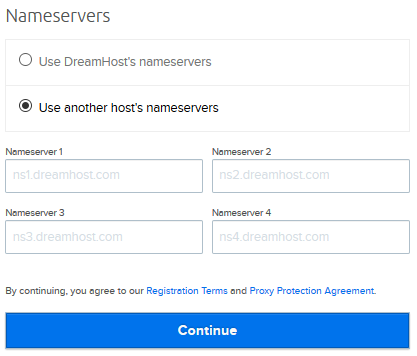 If your domain is already using DreamHost's nameservers, and you choose to use these nameservers once the transfer goes through, you won’t experience any downtime. If you choose to change nameservers to DreamHost's after the transfer completed, downtime may occur. It's recommended that you point your DNS first before beginning the transfer. If your domain registration expires while the transfer is proceeding, your site will go offline until the transfer finishes. 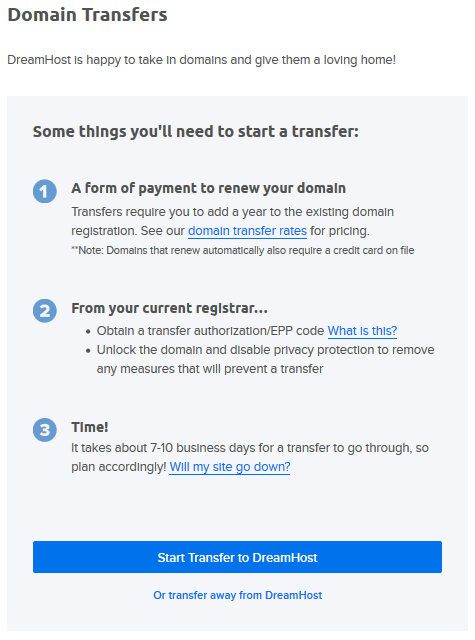 It's recommended you initiate a transfer at least a month before your domain is going to expire. Also, not all registrars allow expired domains to transfer. Check with your registrar first if your domain is approaching an expiration date to see if they allow you to transfer an expired domain. Effective December 1, 2016, ICANN is revising its Transfer Policy. Any change made to the registrant's name, organization, or email address will put the domain in a 60-day transfer lock; it will also trigger notification emails that are sent to the old and new registrant notifying them of the change. Unlock the domain registration for transfer at your registrar. Remove the privacy protection from your WHOIS registration information and make sure a valid email address is set up as the ‘Registrant’ contact to send the transfer-in approval email to. Obtain the auth code, also known as the EPP code, from your current registrar. This code is necessary to complete the transfer-in request. Make sure you have not transferred or registered the domain name in the last 60 days (ICANN policy prohibits transfers in this time period). To begin the process, log into the account you're going to transfer the registration to. If you do not yet have an account, sign up for one on the website. Once created, log in at panel.dreamhost.com. 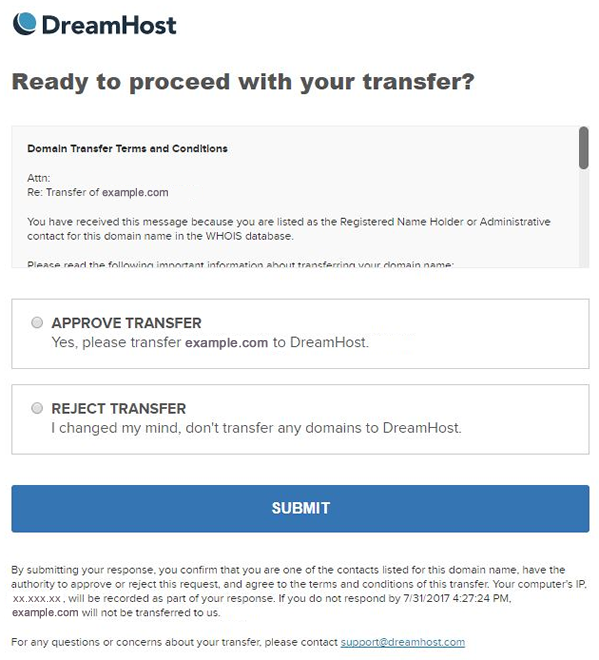 Enter a domain name (or multiple domain names on each line) that you wish to transfer to your account with DreamHost, and then click the Request Transfer button to proceed. If you'd like privacy enabled on the domain's public WHOIS information, simply check the box titled 'I want all my contact information private'. This way, it is set when the transfer-in completes. The privacy setting is free, but DreamHost does not offer this for all TLDs. If you do not see the checkbox for the transfer-in of your domain, that particular TLD is not supported with this feature. The checkbox at the top of this form can be checked to include the details entered in the contact fields to be applied to all four contact fields on the domain registration’s internal ownership detail: Registrant, Admin, Billing, and Technical details are the four contact details for the domain. This form also includes the ‘AUTH CODE for...’ field. This is where you enter the auth code or EPP code for the domain registration transfer. You must make sure you enter it exactly as it was provided to you by your current registrar. The last section of the transfer request page is where you can set the domain registration’s name servers. If you click the bubble for ‘Use DreamHost’s nameservers’, it automatically sets DreamHost's nameservers for you. If you click the ‘Use another host’s nameservers’, it opens up four fields where you can enter the outside name servers you wish to set up. The ‘Registration Terms’ also appears before you continue, so you should read that first. Once you’ve completed this page, click the Continue button to move onto the payment screen. You are charged for the transfer-in unless you have a free domain registration still available with your hosting service. You can read more about the free domain registration with your hosting service in the Free Registration article. 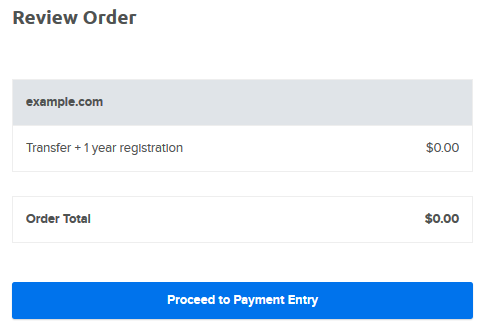 If you need to pay for the transfer, the cost of the transfer of that particular TLD is listed on the order page for you to review before you proceed. Click the Proceed to Payment Entry button to continue. If you need to make a payment, the balance owed for this is displayed along with the various payment options. 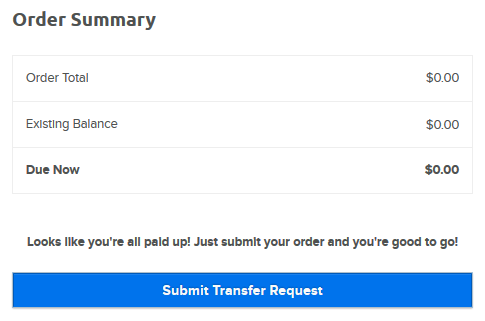 Enter your payment method, and then click the confirmation button for the payment method you selected. After you’ve gone through the payment process and have clicked Submit Transfer Request, a confirmation appears. If you navigate back to the Reg. Transfer page, you'll see it's pending. Any payment you make is held as a credit balance on the account until the transfer completes. The charge for the transfer is then applied. Select the APPROVE TRANSFER option, and then click the SUBMIT button to approve the transfer-in. You should complete this within 4 days otherwise it will expire and the process must be restarted. After approving the incoming transfer through that email, this takes care of half of the process in getting the transfer completed. The other half is left to the losing registrar as they control the release of the domain for transfer. As long as you’ve approved the transfer-in through the email sent for this process, you’ve done all you can on DreamHost's end. You may want to contact the current registrar to ensure that the domain is properly released. Both the approval and release of the domain registration begins the transfer process. It should then complete within a few minutes and up to a few days. You are notified by DreamHost when the transfer completes and the charge for that transfer is applied at that time. Sometimes a transfer doesn’t go through as smoothly as it should. This can be due to a number of reasons. The most common problem is with the approval email not reaching the owner contact for the domain registration. Often times, this is due to the domain registration still having the privacy protection settings enabled. Some registrars offer a proxy email address tied to the mail user that owns the domain name, however, that can get in the way with the delivery of the approval email. To avoid issues, DreamHost suggests that privacy is removed as previously mentioned. Sometimes the message is filtered into the junk/spam folder of the user set to receive this email. To avoid this, it is advised that once the transfer request is placed that you keep an eye on the junk/spam folder as well in case it’s filtered there. 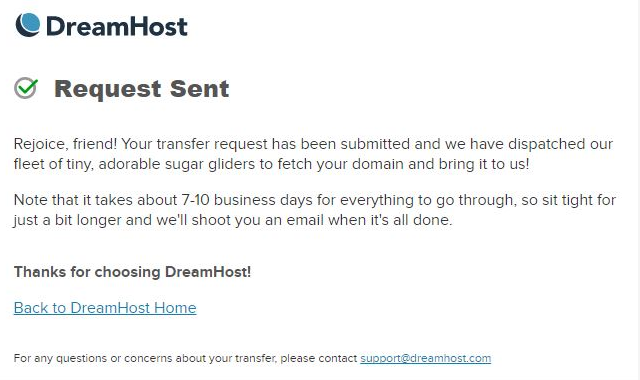 You can consider setting up a whitelisting for the ‘do-not-reply@dreamhostregistry.com’ user as well to ensure that the message is not filtered into junk/spam. Certain domains may have updated the auth code to something else internally. For example, the .ORG registry is quite on top of their security measures and often changes the auth code (EPP code) automatically. It’s possible the transfer failed due to the auth code being incorrect because of that change. If this is the case, the current registrar must reset the auth code and submit the transfer-in request again. Just unlock the domain and try the transfer again. If you notice intermittent DNS issues, or issues with Google's DNS, it may be due to the domain having used DNSSEC with the previous provider. You should contact the previous hosting provider's support to have those DNSSEC records cleared out manually. If you do wish to continue using DNSSEC you can keep the domain registered with DreamHost, but you'll need to use a third party to manage the DNS. This is because while the registration is able to support DNSSEC, DreamHost nameservers currently do not. View the DNSSEC overview article for further details. These TLDs also do not require a lock or an auth code (EPP code). 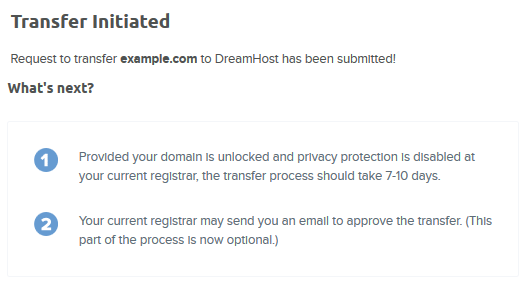 Instead, the process to transfer this TLD is to simply change the IPS tag from the current registrar to DreamHost as described below. 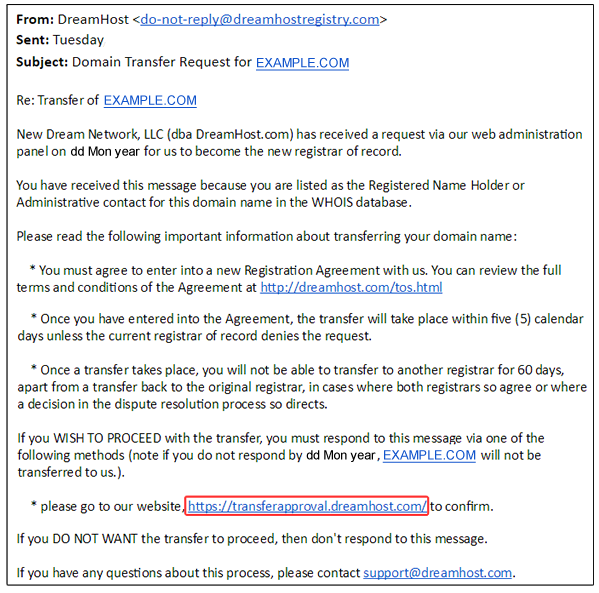 Contact your current registrar, and ask them to update the IPS tag on your domain to DreamHost’s tag which is ENOM. IPS tags are case-sensitive so make sure ENOM is in capital letters. Once that’s done, the domain is no longer in the losing registrar’s control and is in limbo until the transfer completes. You’ll need to request the transfer-in with DreamHost once the IPS tag is updated. When transferring a .IO TLD to DreamHost, you may receive a message from "Key Systems GmbH" indicating that the domain has successfully transferred to them. This is a normal step as Key Systems is the technology partner that eNom uses to to facilitate .IO domain transfers to DreamHost. If you have any questions, you can contact support using the following link: Contact Support. 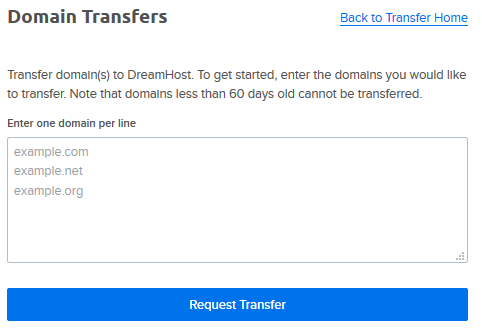 How do I transfer my domain registration from one DreamHost account to another? How do I transfer my domain registration away from DreamHost? Article last updated April 18, 2019 19:34 PST. How do I transfer my live site to DreamHost? How do I use a free domain registration?